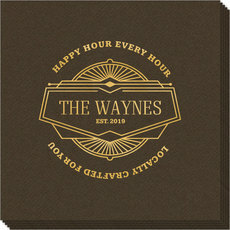 Sample shown using Gold Metallic Foil imprint on Charcoal Black coasters. 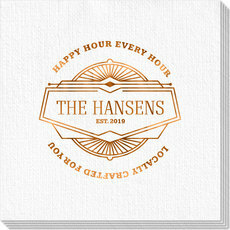 Sample shown using Gold Metallic Foil imprint on Creamy White coasters. 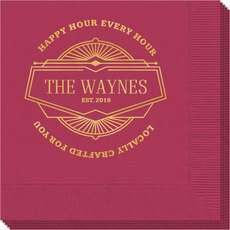 A set of modern and trendy set of coasters on sturdy stock will add your personal touch to your decor. Coasters are a 4" diameter. Your choice of stock color and imprint color. Typestyle and positioning only as shown. Optional acrylic holder is available. Wording "HAPPY HOUR EVERY HOUR" and "LOCALLY CRAFTED FOR YOU." will always appear as shown.